Surely the recognition Filipino food has been receiving is great—why does this make us mad? Because a cuisine that has been developing for centuries, rich in indigenous ingredients and other cultural influences, and eaten by millions of people everyday should not be considered a trend, or the hot new thing. A trend usually refers to a spike in popularity for a period of time, but does not have longevity. This terminology is the wrong description for what is really going on. For decades, Filipino American families have been cooking Filipino food, opening local restaurants and small stores, and sharing the cuisine with non-Filipino friends. Ask anyone who has a close Filipino friend about their knowledge of the cuisine, and chances are you'll hear many stories about lumpia presented in school during international days and pancit brought to potlucks. Just because the cuisine only recently became noticed by mainstream food critics, media, and celebrity chefs does not make it more valuable compared to last year, or the year before, or the decades before when immigrants first introduced Filipino cuisine to this country. To consider our cuisine a “trend of 2017” is like placing it among the ranks of the Atkins or Paleo diet, low-carb, juice cleanses, wheatgrass shots, cronuts, unicorn frappuccinos, and other food crazes. We are grateful that food writers, the media, and celebrity chefs are beginning to notice the wonders of Filipino flavors and the pioneers who pushed our cuisine to the forefront, but please keep the trendy vibe out of it. To consider that Filipino cuisine—or any ethnic cuisine for that matter—is only cool now is disrespectful. Filipino cuisine is hundreds of years old, influenced and developed over time by the many peoples that have landed in its soils and by the bountiful ingredients that grow there. Every dish in our cuisine comes with a story about the region it's from, the cultures it's influenced by, the climates, plants, and animals that grow and live there, and an understanding of the importance of food bringing people together. For example, the Spanish rule over Philippines from the 1500s to late 1800s inspired many tomato-based dishes such as kaldereta, menudo, and afritada. Tomatoes, having originally come from the new world, was introduced to the Philippines by the Spanish(1). Filipinos also created their own versions of classic Spanish dishes, such as empanada and paella. Furthermore, many of our dishes are influenced by the Chinese because they settled in and traded with the Philippines as part of their trade routes, planting deep roots in culture, lifestyle, and cuisine long before the Spanish even arrived(2). As a result, we learned and developed noodle-based dishes and hearty soups such as palabok, pancit, la paz batchoy, molo and mami. We also borrowed steamed buns (siopao), egg rolls (lumpia), and dumplings (siomai) from the Chinese.One of the best examples of cultural melding in our cuisine is a dish from the Chinese but with a Spanish name: Arroz caldo.This rice porridge with chicken, ginger, and fish sauce—sometimes called lugaw—is an exact replica of congee but was given a Spanish name to lure the colonizers into local restaurants called panciterias(3). Though Spanish and Chinese have the biggest influences on Filipino cuisine, we also borrowed dishes and techniques from Mexican, Arabic, Vietnamese and Thai, Malaysian and Polynesian, and American(4). It is truly a melting pot cuisine that continues to develop and adapt to suit the needs of its people—that is another reason it is so incredibly delicious and unique! Other aspects that influence Filipino cuisine is the country's humid climate and island environment. Our cuisine’s love of vinegar and soy sauce originated from the need to preserve dishes in the very hot climate. These two ingredients not only add tons of flavor to meats and vegetables, they also hold important preserving qualities that help food last longer. Congruently, Filipino cuisine portrays many methods for food preservation—especially for fish and seafoods such as dried and smoked fish (tinapa), dried squid (pusit), fermented fish and shrimp pastes (bagoong), and small fishes preserved in oil (tuyo). Moreover, our use of coconut milk in many dishes is not meant to satisfy the dairy-free, lactose-intolerant, or vegan eaters in America. It is used because coconut trees are rich in the tropical climate. Coconut, along with rice, is one of the most abundant ingredients in the Philippines, which is why Filipinos use them for both savory and sweet dishes. Because climate and environment play a large role in the cuisine, Filipino food has changed much over the years. Dishes have significantly developed from the days when our ancestors didn't have refrigeration to present day when we are finding new ways to combine local with international ingredients. Another misconception of Filipino dining is kamayan, which has become very popular in America—dare I say even a trend. This term translates to "eating with your hands,” which is a common practice among Filipinos. 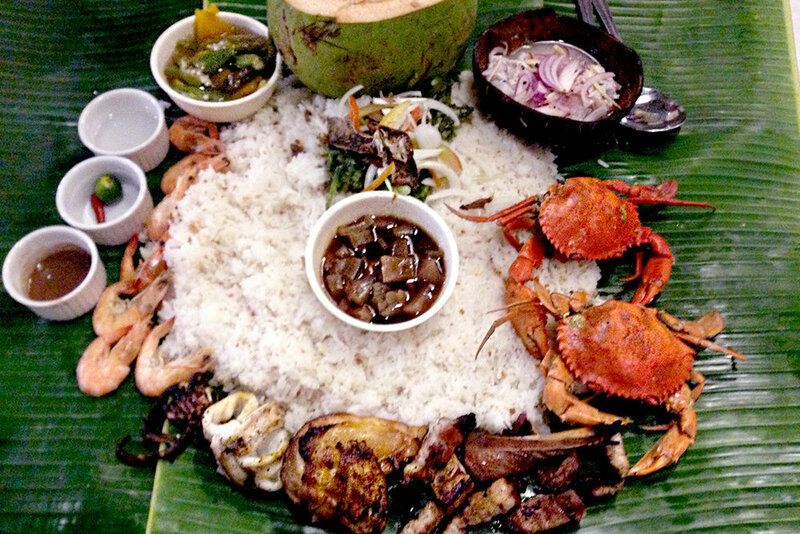 In contrast, the dining tradition of laying out meats, fish, vegetables, and rice on long communal tables covered with banana leaves is actually called boodle fight. This style of eating was first introduced in the Philippine Military Academy then gradually spread to communities throughout the Philippines(5). It’s a dining style that is important in Filipino culture because it exemplifies how Filipinos use food as a means to bring together families, friends, neighbors, and communities. Boodle fight takes hours to prepare and needs the help of many hands. Both kamayan and boodle fights illustrate the significance of food-related rituals in daily and celebratory Filipino life. Having just come from a visit to the Philippines, I can finally say that I now truly understand the origins and purpose of this delicious cuisine. The trip has forever changed my perspective on truly authentic Filipino cuisine versus how it's being portrayed in America and other Western countries. It was so important to experience where we came from and the origins of our cuisine because it ensued a deep understanding and appreciation of my identity, and left me with a yearning to learn more. To the Filipino chefs: we urge you to do the same. Visit your homeland and truly explore the flavors in their natural state. Don’t just make Filipino food based off the latest American trends, or create dishes because other chefs are making them. Learn how dishes vary based on regions and climate. Cook with and eat from street vendors, local restaurateurs, and innovative chefs living in the Philippines. How can we best share this rich culture with the world if we are not truly immersed in it ourselves? We need to understand that the cuisine will be appreciated in its native form. Don't feel mahinhin [shy] to use traditional ingredients, spices and flavors as they were created by our families and ancestors. Use proper names and correct terminology. Share the dishes with pride. Do it right and well. Let’s take advantage of this newly received attention to prove that Filipino food isn't just a trend—it's here to stay. On the plus side, a trend is also defined as “a general direction in which something is developing or changing.” Filipino food has definitely taken a new direction for the better. This in large part is due to two major shifts in society: the growth of globalization, diversity, and travel; and the increasing number of young Filipino chefs with professional culinary experiences willing to take risks and become entrepreneurs. This growing change is not only in context to Filipino food—many ethnic foods are becoming more frequently enjoyed and recognized all over the world for the same reasons. This impact in growing cultural tolerance and diversity is an homage to the millions of immigrants in this country that are unashamed to share their culture with the world. I only wish that writers and media influences refrained from calling this growing change in the food culture a trend and instead focus on truly understanding the dishes and how culture shapes these ethnic cuisines.